i am now shouting for the joy of summer! there is no other feeling on earth that compares with the feeling a teacher has when she walks back through the door from after school duty with the knowledge that she will not teach again for 3 months! praise Jesus! i cried like a baby. i did a really good job when i was giving the "i'm proud of you. you're gonna be great second graders." speech. i even did pretty good when i started hugging them one by one. but then, the closer i got to the end of the line, the closer the tears came. i hugged my precious darlings and started crying. i said something special and sweet to each child. i told kat and emily that i loved them very much and that i would remember them always. then we all walked down the hallway together. our last line as miss henry's first grade class. it was perfect. when i dropped them off at music (we have early dismissal so they will leave from there today) i cried again. by this point, several of my students had tears in their eyes and ran to hug me an extra time telling me how much they would miss me. kat and emily moved to hug me last and we moved into the hallway, all crying. i cried like a little baby. but you know, i didn't cry over only kat and emily. i cried over josh. i cried over the one boy who never ceased to lie. the one boy who never quit picking on other people and tattling on them. i cried over the one boy who, after the first couple of months of school, tried so hard to make me happy even though he didn't know the right way to do it. i believe in josh. i believe he really can be a great person. but he'll have to decide. when he gets older, he will have to have someone else there to show him the way to live. his life right now doesn't permit him to see much honest, don't have to do anything for it, love. i hope that i was able to show him that. i heard him say to one of his buddies before we left our classroom, "dog, i think i might cry." he has it in there. he has the capacity to love and to feel the emotion given the right way. i hope he has other teachers who see his need and respond in the best way possible. i cried for all of my kids going on from here. although there were many times they drove me crazy, there were many more times they made me fall in love with them. their sweet, silly, stinky little personalities. i guess that is what teaching is all about. loving the good and the bad and teaching our kids to make something positive out of it all. you know, i guess my kids taught me the positive too. i pray for this class of soon-to-be second graders. i pray that they will be unaffected by the horrible things in this world. even as i pray that, i know it is impossible. so, i pray that when they are pushed to the limit, there will be a loving person there to show them where to go, how to live. i pray that for the rest of their days, Jesus walks beside them and somehow directs their lives to him even when no one else around them seems to care. i pray that kat and emily will grow up to be healthy, beautiful, smart and well-adjusted women. i pray that josh will find the real meaning of life and learn to share that with others. i pray that in all of the good and bad of first grade, these kids will remember me and know that i loved them dearly. in five minutes, i am taking my class of first graders on a skating field trip. we will come back and have pizza. then, i will shout for the joy of summer. yesterday, i made peanut butter chip cookies. they are my favorite. they have to be the ugliest cookies ever baked, but man are they delicious. jules loves them too. she snuck one off of my napkin when i walked out of the room. i haven't looked at that computer again since then. my personal computer has been out of service for a while now. it was the dumb little thing that cord had to plug into to charge the computer or even supply enough electricity for the silly thing to turn on. it was broken and it was like $300 on the hp website. we waited forever and it sat, taken apart, in a christmas gift bag in the bottom of michael's closet for months and months. he finally found a site the other day that allowed us to purchase the part for $33. quite a difference from the $300 amount. well, that part came in this past week and michael spent a few hours putting my computer back together, new part intact. he finally finished today and although there were a dozen extra screws left out of the computer somewhere, the thing works!! this is my first post from my very own computer! 8 months! my computer was out of commission for eight months! so, thank you babe for fixing my computer! today is friday. the last friday of the school year. today is also the day michael comes home. i am very excited to see him. it has been a long week and i am sure he is as ready to be home as i am to have him home. hurray! it's rainy outside and it feels like we should all be at home sleeping. for the first time in awhile, i feel good. i feel awake and ready to face the day. scratch that. some of my kids just got really loud and ridiculous and i had to take back my happiness for the day. just kidding. i am happy today and i can't wait for my husband to come home! hope you all are having a happy day too! i'm sick. so, so sick. i guess i'll have to take a day off of school. i'll call in a sub for tomorrow. WELCOME TO THE LAST MONDAY OF THE SCHOOL YEAR!!!! i am in love with sharpies! absolutely love 'em. well, today i got my order of start up supplies for next year. 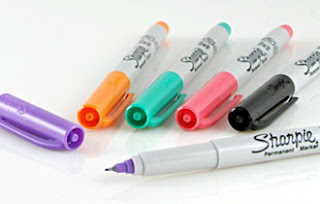 one item i ordered was a package of 29 different colors of ultra-fine tip sharpie markers! i did it and it was totally worth it! i took my portion of the sacrifice (read la's comment to the cookie post)! it was the most delicious thing i've ever tasted in my life. matt & mandy. so cute! we are having a school wide swim party next tuesday. first graders are supposed to bring cookies. so, people have been bringing cookies. some are of the little debbie variety, some are prepacked like oreos and chocolate chip. some...some are homemade. today, three of my kids brought cookies. there is a box of oatmeal cream pies. there is a sack of m&m chocolate chip. there is a brown paper sack full of individually wrapped, homemade oatmeal cookies. i did not eat breakfast today. the oatmeal cookies look delicious and they are calling my name. friday is the most glorious day in the entire world. only five hours until it gets even better. matthew got here around 6:30 last night. he brought along his friend issac, who has been practically a part of our family for quite some time. it was nice to hang out and talk and laugh with them again. those guys are so funny! michael got in town just in time to go to dinner with us. it really was a good time. when we got back to mom and dad's, matt phoned his girlfriend mandy. i talked to her for awhile. she is so sweet! love her to death! at one point she said, "oh i miss him already! how am i going to make it three more days?!" that is exactly the stuff i like to hear from the girl my little brother is in love with. ahh. he is supposed to send me a picture soon, so be looking for the cute couple! my little brother is coming to town today. he lives in little elm near my older brother and sarah...and ellie. i'm sure when he gets here he'll rub that in big time! i'm sure he got to see ellie as recently as yesterday! jerk! i am really excited to see him and can't wait to give him a huge hug. he's actually not my little brother, he is my younger brother. matthew is quite a few inches taller than me...i like it! he takes care of me and i like to do the same for him. i play, very well i might add, the role of the protective sister. he has a girlfriend, mandy. she's okay, i guess. no-she's great! ;) i just have to make sure matt is happy, and he is! if he is, i am. mandy is great! he should be getting here soon. hurry up baby boy! i can't wait to see ya! in 27 days i will be traveling to plano to spend a week with sarah and ellie. landon will be going on a missions trip and i will be filling in while he is gone. i can't wait! sarah and i grew close immediately after she and landon started dating. she is one of my best friends and i miss her terribly. everything is fun when we are together and we like to do a lot of the same things. that makes it even better! i last time i saw ellie was shortly after my wedding, almost two months ago. i am dying! i love her so much and she is getting so big. i love watching her grow through the pictures on sarah's blog. thank goodness for the internet, otherwise...i would die. there are nine days of school left. nine. one of those days will be taken over by a school-wide swimming party. the last day will be taken over by a skating/pizza party. i'm bored with the way the blog templates look. i've spent almost 45 minutes of teaching time just trying different things. i'm not happy with the way it is now, but i'm too tired to continue. today is a rough day. i am ready for summer to be here. i have 2 1/2 hours left in this day. once it's gone it will never come again! then...just eleven school days until the finale! i can't wait! i can't wait, and neither can my kids. we went to the lake for mother's day. it was really fun. we all took our dogs and sandwhich stuff and had a blast. below is a cascade of pictures proving that our only baby, our 2 1/2 year old dog, jules, thinks she's a real human. michael saying he loves me! made it! "daddy! help me!" jules-the very spoiled puppy... i mean baby. this is an email i just shared with some of my teacher friends. it's sad, but totally and completely true. i cannot begin to tell you how irritated i am. oh my gosh. this is the most absurd thing in the world! my kids are doing things they haven't done all year. things they know have been off limits, ALL YEAR. it's CRAZY! i mean, honestly, seriously i cannot for the life of me understand this ridiculousness. they are absurd! they are nuts! they are crazy! i must have started talking like the teacher on charlie brown because these kids won't listen to a word i'm saying. the most i can figure is that THEY DON'T UNDERSTAND THE LANGUAGE I AM SPEAKING! HOLY HELL!!! that is what i am in right now! HELL! how on earth will i ever get out of this dungeon! eating lunch with 22 6-7 year olds who are ready for school to be out. 22 6-7 year olds eating lunch with a teacher who is ready for school to be out. it wasn't pretty people. it was down right scary. our principal is having lunch catered today for teacher appreciation week. the food is coming from nachos, a good, little mexican food place here. you know things like that are what help you get through the day at the end of the school year. it's senior luncheon day so we have to eat in our classrooms...with our 22 children. she knows that there is a possibility i will be moving this summer. i had to tell her. she, of course, was very understanding. she doesn't want me to go but she knows my marriage is more important than her having a great (hehe! ;) ) teacher. i have decided i will fill out an application for the sa district i mentioned yesterday. i guess i will just let God handle the rest. if He wants us to go, we'll go. if not, we won't. the question of moving still hangs in the air. it hangs heavily. we're just ready to be together. michael is tired of the commute. he is tired of his home only being his home 2 days a week. it's crazy. i don't know how he's done it this long. now, a new question looms in front of me. i have put off applying for jobs in sa because i didnt know if we were moving. now, i wonder if the best thing might be to just have my bases covered no matter what. i got online and read up on one of the sa districts. i've heard many good things about this district and they are continually opening new schools. it's a good area of town and everyone i've talked to has good things to say. they are hiring a huge amount of teachers for the upcoming school year. i decided i was going to apply, i mean i stand a pretty good chance to be one of the 800-1000 teachers they are looking for. however, if you are an experienced teacher, one of your required references must be your current principal. whoa. there are many changes going on at my school here and i'm afraid if i tell my principal that a move is possible, she may move me to the bottom of the totum pole. i mean, i am one of the newest teachers here, but i don't think at this point, she would mess with our team. we work really great together. we teach great together. it's just a good team that she never has to worry about or deal with. now there is a teacher who wants to move up with her kids next year. if i bring up the move, and then we decide not to, will she have already filled my space? i'm just scared and worried and i wish the answer were right in front of me. i have found that i am now absolutley addicted to scrapbooking. silly isn't it? but you should see the pages my friends and i come up with! crystal and jenny are both so stinkin' creative it's ridiculous! i take my camera everywhere now. i just keep thinking: event=pictures, pictures=scrapbook, scrapbook=fun! as we each shopped for our scrapping needs, we mentioned how we just hoped we would actually stick with it after spending so much money. ha! i don't think that's an issue now. we are all so addicted you couldn't make us stop! everyday i go home from school, and i do something productive. i have cleaned, organized and done laundry everyday. i'm not finished yet, but it feels great! but it's exciting to me. i finally feel like i'm getting some energy back. i feel normal again, and that is...EXCITING! 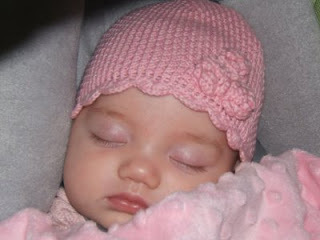 my beautiful niece, ellie, is three months old. well, she will be on the 13th. how on earth can she be 3 months old?! i haven't even seen the child in a month and a half. that is way too long to go without seeing the most beautiful baby on the face of the planet! i'll be able to spend a whole week with her this summer, in her town, with only her mama. there will be no one else to take my attention from her or her's from me. thank goodness. i don't think i've been myself since getting engaged. i am usually a big organizational freak who has to have everything perfect. uh...i haven't actually been that way for the past 7 months or so. it's been driving me crazy, but i haven't had the energy, or want to, to do anything about it. yesterday, i wrote more thank you notes. i will finish them today. i also bought a paper shredder yesterday, which has made my life a million times better. there were old bills and bank statements and random little papers that needed to be torn into tiny pieces of paper for the trash. now, they are shredded and in the trash and i am feeling great! i am ready to go home after school and get the rest of my house in order! it's being called the biggest upset in nba playoffs. the precious mavericks were sadly defeated, again, last night by the golden state warriors. it was such a sad series. last night as i watched the game, i felt so sorry for dirk. the warriors know he is the main strength of that team. although the mavs usually have many other great players as well. well, the warriors played smart and kept a close eye on dirk. he was hardly allowed near the basket. plus- early in the game, the mavs went over in fouls and therefore every foul thereafter, was worth a free throw for the warriors. as michael and i crawled in bed last night, he mentioned many ironies about the game. the fact that the last game of the season, the mavs sat out their starters to rest right before the playoffs. they lost that game...to golden state. if they had won that game, the warriors wouldnt have even made it to the playoffs. there were many other weird things, but i was just sad. number one seat out of the playoffs in the first round. there is nothing new to blog about but i was tired of looking at the title of the last post. so, thought i would change it. basically the only thing going on here, now, is that we are under severe thunderstorm, flash-flood and tornado warnings. some kids are scared, but all of mine seem to be doing fine. they are sitting at their tables calmly watching a video and eating their snacks. earlier in the hall there was an incredibly loud clap of thunder. some classes screamed. i turned around and all of my kids were in their stoic, straight line that i have taught them to be in at all times. i was proud! 18 minutes to go in this school day! hurray! well...that is if the weather doesn't keep us here. yikes! do i ever get anything done? i have been waiting for this day for two weeks. tonight, i am going scrapbooking. sounds a little silly, doesn't it. but after my preview to scrapbooking last week and all of our wonderful goodies we bought, i am excited to make more pages and slide them into my book. our number has grown from just jenny and i to include two of our other friends, crystal and chistal. hehe! christal and crystal are both wonderful and we all get a long so well. we will all be sitting in jenny's craft room tomorrow (i know, two days in a row!) talking about girl stuff and creating beautiful scrapbooked pages! now, if the next 9-10 hours would pass quickly.